Since I've been downsizing my beauty collection and limiting new purchases to just the essentials, I've found myself making more time again for testing sample sized products! A lot of the samples I have in my stash are more like travel/luxury mini sizes, so they last much longer than most which is great for my bank balance! 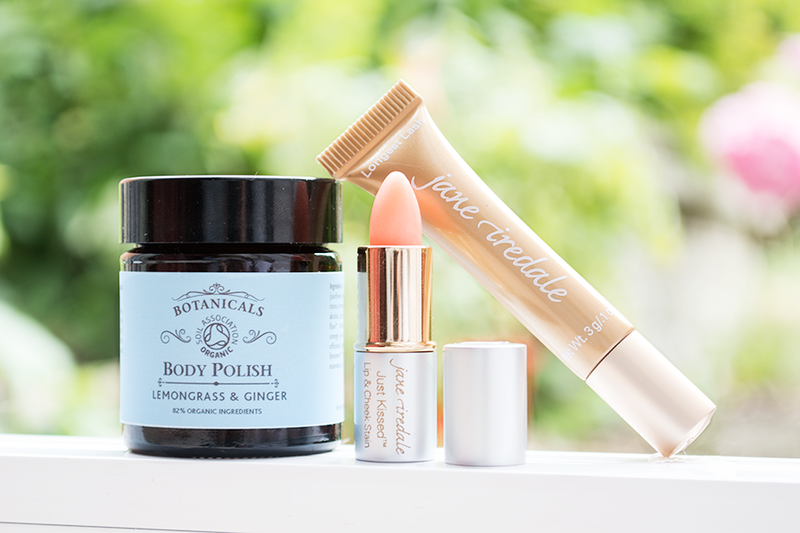 This time around, I've been testing a body scrub from Botanicals along with a couple of makeup items from Jane Iredale too. I adore anything with an uplifting zesty scent, so it's no surprise I love this product! This actually has to be one of the nicest scrubs I've tried as the sugar grains and Himalayan salt crystals are just abrasive enough to feel like it's working properly, without being overly scrubby either (if that makes sense)! You can always expect fantastic ingredients from Botanicals so this is, of course, no exception, containing 100% natural and 82% organic ingredients. To use, you only need a small amount and a few drops of water to turn the scrub to a creamy consistency, keep rubbing until all the granules are dissolved, then rinse away. The end result leaves you feeling refreshed with seriously smooth skin! This is definitely a luxury treat at £19.95 for a full sized jar. This is such an interesting product. When you first apply, it's invisible on the skin, but give it a minute or two and a custom pigment will start to show as it adapts to your skin's pH (acidity). It's easy to layer up for a more intense colour too. On my skin, the colour comes out at a cool-toned light pink and a brighter medium pink on the lips. It lives up to its promise of a stain, lasting all day, and I also have to mention it smells like berry sweets! To be honest, I don't reach for this very often so I imagine this cute little sample is going to last for ages! The packaging is what intrigued me the most about this mascara, being in a squeezable tube which makes it easy to ensure the oversized brush is totally coated and it's useful when the product starts running low too. This mascara doesn't particularly give me much more length than most other mascara I've tried, but the thick formula holds a curl really well which definitely helps to give the illusion of longer lashes! It lasts throughout the day with absolutely no smudging or flaking and it doesn't irritate my eyes at all. I never seem to use the same mascara twice, so I won't be repurchasing, especially as the full size comes at a pricey £26 (although you can pick up this mini tube for £2.50 at Naturisimo which works out much cheaper per gram)! The lip & cheek stain sounds absolutely lovely! I'd like to try it. It is a lovely product, I'm sure you'd really like it! nice choices! The forever peach lip & cheek stain is my new fav! I love the lip stain, it suits me perfectly when the colours develops! Not keen on the mascara though, it's gotten so messy because of the wand being so much bigger than the tube & it doesn't offer much volume either!